Steve Caton worked as a guitarist for Tori Amos from her very first Atlantic release, Y Kant Tori Read to her fifth solo album To Venus and Back in 1999. They met in Los Angeles in 1985 as they were both trying to launch their career in the music industry. Caton was in a band with Matt Sorum at that time, Tori joined them and became the lead singer. The group was then renamed Y Kant Tori Read and got signed in 1986. The album was recorded in 1987 and when it was released in 1988, we know what happened: it failed miserably. However, Steve and Tori continued to work together: beside Y Kant Tori Read, Tori had sung in most of the bands the guitarist was a part of in the 80s. When Tori recorded her first solo album Little Earthquakes, Caton was there and his sound took more importance over the years. 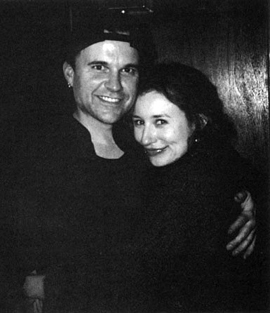 In 1996, he toured with her for the Dew Drop Inn Tour and played guitar on a few tracks ("Cornflake Girl," "Caught A Lite Sneeze," "In the Springtime of His Voodoo"...). When Tori chose to tour with a full band in 1998, Caton was of course there and, with Matt Chamberlain on drums and Jon Evans on bass, he brought a characteristic sound to tracks such as "Precious Things," "Waitress" or "Caught A Lite Sneeze," among many others. However, in 2001, Caton announced through the web that he would not participate to Strange Little Girls for personal reasons and that he would no longer work with Tori. Neither of them made further comments about this professional break-up, but insistent rumours have suggested that Caton blamed Tori for not promoting properly his band Binge or that he wanted to have royalties on the albums’ sales because he considered he was a really important part of her sound and not merely a guitarist. A lot of fans believe the song "Not David Bowie" is about Caton and their falling out. Steve Caton is also a singer, songwriter and producer.